The Civil War was the first time in American history that photography was extensively used to make a public record of events. The art of photography was only 21 years old when the Civil War started, but it was already hugely popular. For the first time, middle-class Americans were able to have their portraits taken, because photographs were much less expensive than paintings. Before they left for the war, many Civil War soldiers had their portraits taken by traveling photographers or small photography studios, usually using a type of photography known as ambrotype. Ambrotypes were one-of-a-kind images made on glass or metal and stored in small glass-covered cases. Photographers not only took portraits of soldiers, they also traveled to camps and battlegrounds. Most of these photographs used a wet-plate negative: a glass plate chemically treated, then exposed to the image from 5 to 30 seconds, creating a negative that could be printed on multiple pieces of paper. Civil War photographers were not out on the battlefield as fighting was happening; the photographic equipment was bulky and delicate, and the process of exposing and developing the images made it virtually impossible to take action shots. What photographers did instead was to photograph the battlefield after fighting had ended, often before wounded or dead soldiers could be removed to field hospitals. Field photographers were known to rearrange dead bodies on the battlefield to make their shots look more dramatic. 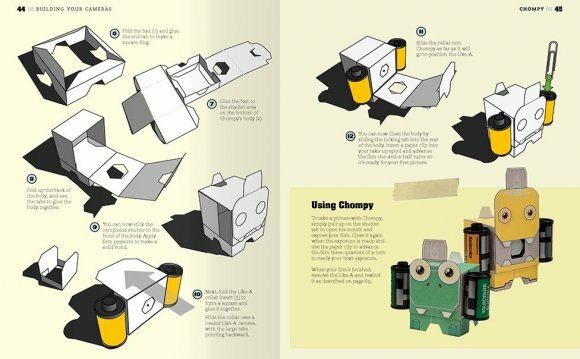 Here’s how you can make your own Pinhole Camera, much like the ones Civil War photographers used. Cut the cardboard to 5 3⁄4 inches long and 1 1⁄4 inches wide. Then measure four equal sections 1 7⁄8 inches wide. Use a knife to cut the cardboard slightly (not all the way through) so that it’s easier to fold. Fold the cardboard into a box and tape it with black tape. Using the black paper, make a lining for the inside of your box. Insert the box into the film cartridge, with one of the open sides of the box toward the film cartridge (so that the film cartridge creates a fifth side of the cube). This should be a snug fit. To create the front of the camera, cut another rectangle of cardboard, 2 3⁄4 inches by 1 1⁄2 inches. Line this piece with black paper or paint as well. Cut a 1⁄2-inch square hole in the center of this piece of cardboard and tape a 1-inch square of aluminum foil over the hole. Punch a small hole in the foil with the pin, being careful to make it as small as possible. Fasten the front of the camera to the rest of the camera with two strong rubber bands. Make sure that no light is leaking into your camera. Use the black tape to cover any holes. When you aren’t taking a picture, the hole must be covered by a piece of black paper. Tape paper over the hole or create some kind of shutter that slides across the hole. Use the dime or nickel to advance the film, turning it counterclockwise. There is a small window on the side of the film cartridge that will indicate the advancing of the film. The film will be in proper position when the numbers 3 and 4 show up. Make sure that the camera is stable; the best pictures will be produced when the camera doesn’t move when the film is being exposed. Set it on a solid surface. Cover the pinhole with black paper after each exposure. To ensure you get a decent image, take your picture two or three times with different exposure times. The technique of taking three exposures—one with the recommended exposure time, one with twice the time and one with half the time—is called bracketing.